When you return to Arvena, you'll learn there is yet another lion in the basement. Kill that one and go back upstairs. Arvena will tell you that she suspects Quill-Weave - a neighbor of hers - is responsible. She says that Quill-Weave has never liked her rats and has been sneaking around Arvena's house at night. If you talk to Quill-Weave, she'll deny any involvement. You're going to have to catch her in the act to make her confess. Around 8pm, Quill-Weave will go into sneak mode and head for Arvena's house. 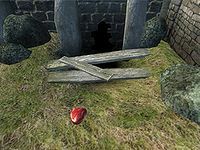 You can lie in wait for her there or follow her around Anvil till she gets there - if your Sneak skill is high enough. After she drops some meat next to the hole into Arvena's basement, you'll get a journal entry; talk to her after that and the truth will come out. Quill-Weave says she didn't mean to lure the lions inside; she was just trying to lure the rats out so the guards would kill them. You can decide whether to keep her secret or not. If you tell Arvena that Quill-Weave had nothing to do with it. Quill-Weave will give you a free one-level boost in Acrobatics. If you tell Arvena that Quill-Weave was behind it, Arvena will give you a free one-level boost in Speechcraft. Quill-Weave will still be available as an Acrobatics trainer but she'll call you a "rat" every time you speak with her, no matter how high her disposition toward you is. Whichever option you choose, Arvena gives you the same level-dependent gold reward and your Fame is increased by one point. If this is the first Fighters Guild quest you have completed, return to Azzan for promotion to the rank of Apprentice. Following the completion of this quest you can return to Azzan for another Fighters Guild quest, The Unfortunate Shopkeeper. You can also instead go to Cheydinhal and get the quest The Desolate Mine from Burz gro-Khash. 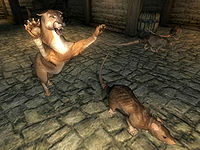 Kill the mountain lions in the basement quickly - if all the rats get killed, Arvena won't need your services any more. This also happens if you kill all the rats before obtaining the contract. The quest will be completed but you will get neither Fame nor free skill training. Even if all the rats are killed though, you will still be ready to be promoted to Apprentice rank without completing any additional quests. Despite Quill-Weave referring to the meat she leaves as rotten, it is identical to any other you might find. If you are in a rush, you can kill the lions yourself before Pinarus arrives at the location - he takes a long time to get there. Note that doing this will trigger a minor bug and make Pinarus wait for you indefinitely. As a result, he will not be available for training before you have led him to where the mountain lions are, even after the quest is completed. A possible fix may be to break into into Arvena's house. From inside, make the quest active. Open the console and use the command: getstage FGC01Rats. The returned stage should be 10.00. Then use the movetoqt command. You should appear outside Arvena's house, with Arvena standing right in front of you. Esta página foi modificada pela última vez à(s) 22h51min de 18 de junho de 2015.